After payment you will get a code. Send it to me (via the tab on the page of the purchased product) and write your e-mail, to which you want to register an account with LossLessClub.com. Invitations are sent manually within 12 hours after the transfer of the e-mail address and the unique code. 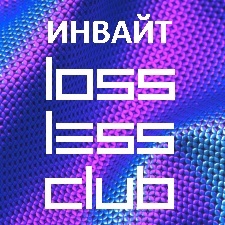 I ask you to pay attention, that it is impossible to send invites to e-mail, which were previously registered on the website LossLessClub.com. Prepare a new address. Recently, it is forbidden to use mail from mail.ru at Losslessclub. Please use any other. Please leave a positive review!